© 2003 Estate of Harry Bertoia/Artists Rights Society (ARS), New York, New York. Photograph by R. H. Hensleigh and Tim Thayer. Bertoia taught metalwork and graphic art at Cranbrook Academy of Art before moving to California to work with Ray and Charles Eames. In 1950, he moved to Pennsylvania, working for Knoll Associates and on his own sculpture works. 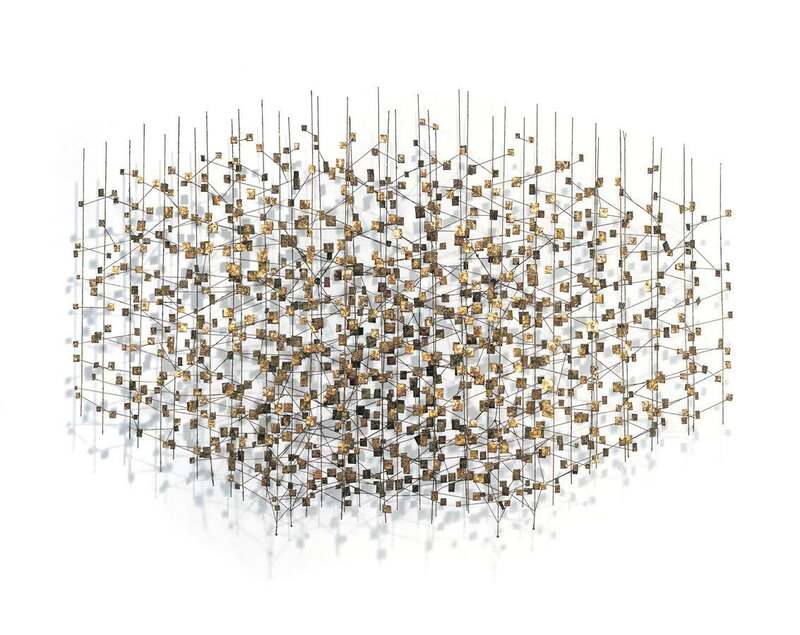 Manipulating form, space, light, texture, color and movement, Bertoia was the most versatile of artists, and his work as a metalsmith, designer of jewelry and furniture, sculptor, painter, and printmaker is innovative and varied. Years ago in a Pennsylvania barn, his widow Brigitta Bertoia created a symphony of sound by striking over two hundred sculptures of varying sizes in a magical moment. The movement and melodies of the sound sculptures are implied in this wall sculpture, as if waiting to be activated by the flickering light of a fireplace.